Does this look like someone you want to leave the fate of the world to? 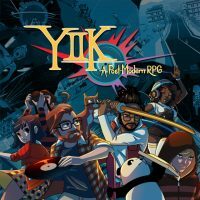 YIIK (pronounced Y2K) is a game I’ve seen a few times at various gaming conventions, and each time I’ve given it a try, I came away satisfied with what I played but nothing outstanding came out of any of those experiences. It wasn’t until I saw it featured in the Kinda Funny Games Showcase that I was reminded of its existence, and knowing that it was almost finished, I had to get my hands on it. Unfortunately after giving myself a full go at it, I don’t have very many pleasant things to say about the game. 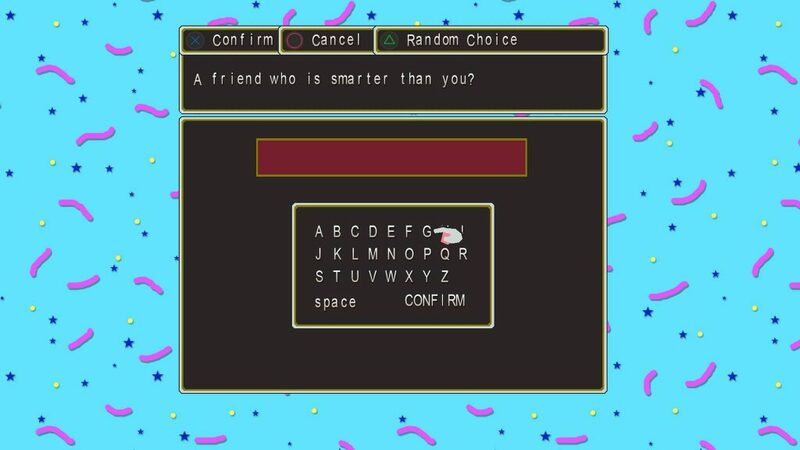 It starts off great as you’re naming yourself and putting your friends’ names into various queries that a nice crow by the name of Marlene asks you. It ends up taking a Pokémon and Earthbound vibe with the charm here, and then comes the actual meat of the game. The beginning of the game where you’re giving names is one of YIIK‘s most memorable qualities… Uh oh. YIIK: A Postmodern RPG follows the likes of a guy named Alex who just arrived home after finishing college. He eventually follows the cat around until it heads to a factory just outside town. Upon entering, things get a little supernatural before finally finding the cat’s owner, a girl named Sammy whom Alex believes he’s familiar with. Before we know it, she’s abducted by aliens and the game totally goes haywire with the plot details. The game is all about the strangeness–I’m also all about the strangeness, but even that wears out its welcome in its failed attempt at trying to get you invested with the game’s cast. A good RPG has a good cast of characters, a battle system that makes sense, a world that takes you away from reality, and hopefully a soundtrack to keep you enamored. YIIK actually actually has quite a bit of these things, but they’re all hampered by the game’s cast, particularly its unsavory main character. For lack of a better term, the main character Alex is a complete jerk. There’s absolutely nothing to like about him. Everything from his character art (if you were to picture a toxic gamer leaving bad comments on social media, they’d look like Alex), his tone of voice (the only time he ever expresses any real feeling is when he’s angry and when he’s thinking to himself), and his overall mannerisms (he shows no sympathy for a character in the game who watched his 12-year-old sister kill himself, and he fights back when his mom advises him to get a job when she gets laid off–just to name a few of his “SMH” issues). The theme during the journey is sort of about improving the guy that Alex is, but each chapter in the game is about as infuriating as it is boring, and the supporting cast (while morally better people) don’t really do much to save it. It even tries to be a game that questions moral fiber by lightly addressing bigger issues like racism, but they don’t really delve into these subjects with much finesse. It’s a shame too because the battle system is pretty solid. It’s a turn-based system that takes a page out of the books of games like the South Park RPGs, Earthbound, and Undertale in the sense that every turn has you actively doing something. Alex’s main weapon is a vinyl record that spins, and every time you can chain combos by timing your action button presses. Michael, a photographer, uses his camera as a weapon and it’s activated by a timing mechanic similar to what you’d see out of a rhythm game. Vella, an apparent “musical prodigy,” uses a keytar where you pull back on the stick and release and right time for a proper combo. There are eight characters in the game and they all have specific weapons that are used in specific ways, and as you upgrade their gear, an additional gameplay component is required to get the most damage out of the item. That said, while they’re interesting at first, it gets old quick. It also doesn’t help that frames skip a lot during these timing segments, adding even more frustration. Luckily, the random battles in the game aren’t too plentiful, but that also makes things annoying with the game’s grinding mechanic. Problems aside, YIIK‘s battle system is pretty solid, and the music makes it even better. 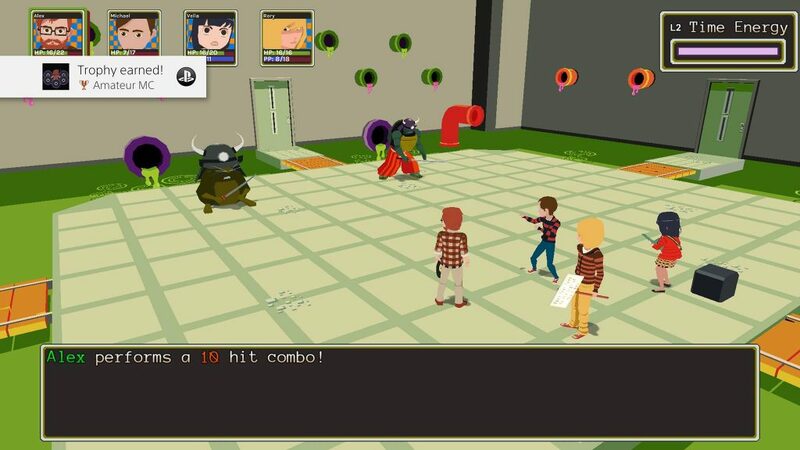 YIIK is one of those RPGs that require you to level up by going to some sort of hub outside of battle. It doesn’t happen automatically, and the worst part is it’s a locked feature until about a couple hours or so of playing the game. Once you gain access to Alex’s “Mind Dungeon,” you have your choice of which specific stats you want to upgrade, and each level up costs 100 experience points. This was probably done to add to the game’s obscurity, but it all just feels like a waste of time when that’s something you can do via a menu. The game’s overworld draws parallels to that of the South Park games as everything looks flat and pretty blocky. That said, there’s a pretty designed style here that leaves a lot to like, and it’s definitely nice that there’s no lack of color. I wouldn’t say it’s a world I’d love to be enveloped in, as some of the apocalyptic-esque stuff is on the outside of creepy, but it doesn’t do anything to bring the game down. It’s one of the few unique things that make the game more enjoyable. The other enjoyable quality is the game’s soundtrack, which actually does a fantastic job setting the mood in when it needs to, and each of the battle tracks is something players will likely bob their heads to when it comes to both the lyrical and non-lyrical compositions. In fact, Toby Fox (Undertale) and Hiroki Kikuta (Secret of Mana) lended their talents to the music direction, so the music being great comes at no surprise. 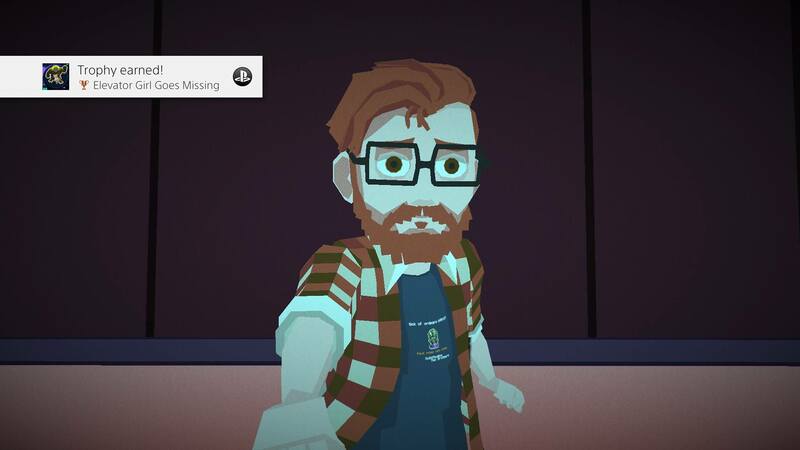 YIIK is sound and weird enough to pique your interest when you hear about what it entails, but it’s also one of those games that makes it really hard for you to find something there is to really like about it. I finished the game in a little over 20 hours, and that was extremely hard for me to do without getting distracted. As stated, it has a solid battle system and has an interesting world encompassing the game with fantastic music to boot, but the game’s unlikable and mentally monochromatic characters really leave much to be desired. That said, even though YIIK strikes out, there’s definitely some potential in the game’s overall design with a pretty solid foundation that leaves room for plenty of improvement, and I wouldn’t mind giving Ackk Studios another chance at making another Post-Modern RPG.